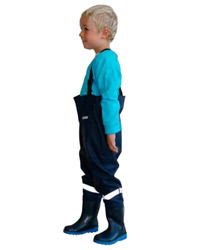 Waders feature extra wide 'high frequency welded' seams that ensure reliability under the most extreme conditions, belt braces with fix lock buckles and high quality boot. 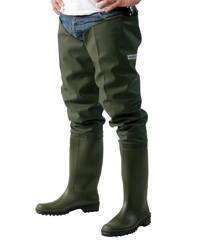 Waders feature elasticated braces with fix lock buckles, internal chest pocket and sturdy cleated sole. 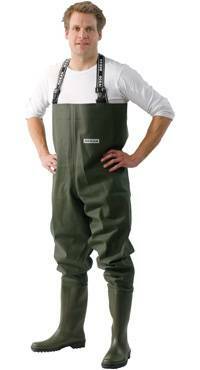 Fabric has slight stretch for comfort. With elastic and press studs. Belt straps. 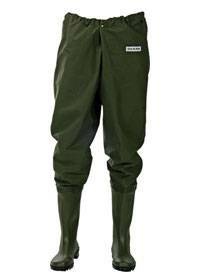 Waders feature extra wide 'high frequency welded' seams that ensure reliability under the most extreme conditions, belt braces with fix lock buckles, high quality boot and fabric has slight stretch for comfort. 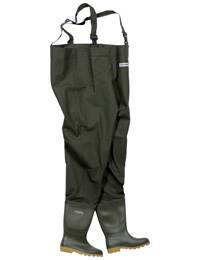 Waders feature extra wide 'high frequency welded' seams that ensure reliability under the most extreme conditions, elasticated braces with fix lock buckles, internal chest pocket and high quality boot with sturdy yellow cleated sole. Fabric has a slight stretch for comfort. 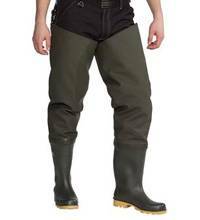 The Ocean High performance breathable waders is made in polyester/teflon grade 4 with a membrane and Dupont Cordura knee re-enforcement. 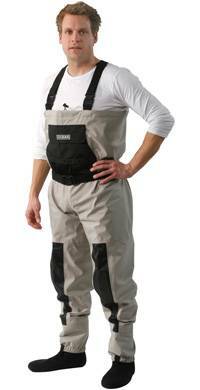 Very light and with many features like chest pocket isolated fleece, adjustable elasticated braces with fix lock buckles. High quality 3,5mm neoprene sock.